During October 2009, HAMNET was approached by the Johannesburg Disaster Management to become part of the communications team preparing for the soccer World Cup as well as the Ekurhuleni Metropolitan Municipality that covers the East Rand area. One must remember that Gauteng South has three major Metropolitan Areas namely Johannesburg itself, Ekurhuleni that covers the East Rand From basically Bedford View to Springs in the far east rand and Mogale Metropolitan Area that covers the West Rand. The Johannesburg communications team comprised people from all walks of life and included at least 3 communications specialists to assist with the establishment of the network to cover events during the SWC. However, prior to that, during a Disaster Management Forum meeting held in August 2009, we had guest speakers from various organisations elaborating on their involvement, approach to and planning of various scenarios that may occur before and during the SWC. These were representatives from S.A. Police Services, The Civil Aviation Authority, Health Departments, Emergency Medical Services, Provincial Directors, Traffic authorities and so the list goes on. No stone leading up to the event was left unturned, inspected, discussed and replaced with a plan of action. Hamnet’s final involvement began fairly late in the run up to the event – around March 2010, three months before the opening ceremony. This was due to the Joint Communications Committee in their planning realising that they had to plan for the eventuality of there being a total blackout of all types and forms of communication. All normal forms of communications are lost and our brief would then be to restore communications by utilizing amateur radio frequencies or any other appropriate frequency with Hamnet members seconded to the emergency services at key points. A disaster occurs in an area where normal communications is nonexistent and Hamnet would have to set up a radio link between the incident and the controlling authority. The JCC building did have its own power supply generator should general power fail – and so did all the soccer stadiums around the country! We were invited to attend meetings within the building allocated as the Joint Communication Centre which in itself immediately presented some problems. The building was a classic example of a Faraday Cage with result communications from the control desk on the 3rd floor on 2 metres to a repeater on the roof, another 8 floors higher, was impossible. We then looked at running a cross band set-up by utilizing 70cm from the control room to a repeater on the roof and then out on 2 metres. This worked well as the JCC was within simplex reach of both the stadia – Ellis Park and the main arena, Soccer City – and many of the other venues due to the height of the antenna! Our next objective was to obtain a list of all the Fan Fest Parks, Team Locations (Hotels etc. ), Training Venues, Township TV facilities, Park and Ride facilities, Bus Routes, Park and Walk facilities, and finally, the Road Closure list on days of games at the two venue’s. Once this was done, we then drew up a list of all the volunteers in the Gauteng South Region – looking particularly at those with mobiles and 2 m facilities. The authorities at this point also invited us for a photographic session so we could be issued with EMS (Emergency Management Service) volunteer cards with our speciality embedded in the card. All the volunteers were briefed on their roles via meetings and on an individual basis prior to the start of the event! The South African Police Service then required a complete list of all the volunteers including their types and makes of vehicles, registration numbers, name of driver, ID number colour of the vehicle etc. All this was done within a deadline of completion being one month prior to the opening ceremony. This was for accreditation purposes. The Accreditation Routine was extremely strict – and so was security. Should there be an incident and a volunteer was required to do duty, that person first had to obtain a security clearance or accreditation certificate, attend to his call out and then must return the certificate from the issuing point after the incident is over! We then ran into a problem regarding the equipment required for the ops room. Some new equipment including a suitable Flight Case had to be urgently obtained from suppliers locally and from Japan. We were also donated a good working 2nd hand laptop as this was going to be built into the Flight case for Internet and APRS usage if required. Although the emergency unit (kit) was ready approximately one week into the month long event, we decided in consultation with the JCC committee that we will remain on stand by and should it be necessary to install the emergency kit into the ops room, this could be accomplished in a very short period of time! The committee were happy that Hamnet was in place and that all the volunteers were on stand by if required. We also needed permission to possibly drill holes into the wall on the roof to mount the antenna. This was ruled out and an alternative arrangement was prepared whereby the antenna was mounted on a footplate that was held down by concrete slabs to prevent the wind blowing down the mast. Fortunately, to erect this was never required – but it was in place! This arrangement remained in place for the full duration of the games – locally and in other centres – as all games were displayed on Fan Park TV screens where anything could go wrong. This takes care of Gauteng South Province. In all the other cities/venues like Cape Town, Bloemfontein, Port Elizabeth, Durban, Rustenburg, Polokwane, Pretoria and Nelspruit, the arrangements for the volunteers was not that elaborate as in Gauteng. Each town or city had at lest 3 people who were on standby and in communication with their local Disaster Management and SAPS members should they be required tor duty. 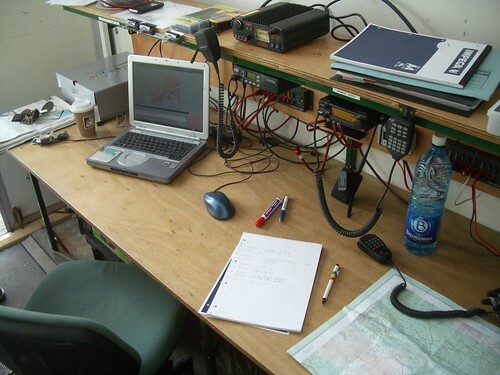 We know that Bloemfontein, Cape Town and Durban also had special facilities within their Disaster Management ops rooms for communication to any volunteers in their vehicles as well as being able to communicate directly with the main Hamnet station in Johannesburg via HF, Echolink or Skype through the Internet. In all, it turned out to be an excellent operation in preparing for something that my or may not happen. Gauteng South benefitted by way of now having 2 emergency kits available and Cape Town will benefit from taking over one of the rigs for use in their ops room. Gauteng disaster Management with its ops room in Midrand, were never part of the Gauteng South plan but they were on stand by for the whole period of the cup event. In total, for our area only, the number of amateur radio operators that took part – Hamnet and non Hamnet volunteers, totalled around 65 people. We also wish to thank the authorities for allowing us to form part of and be on stand-by during this whole operation and sincerely hope this will benefit closer cooperation between Hamnet and local authorities in the future! Reporting for Hamnet, this is Francois Botha, ZS6BUU – National Director. The Castlebar International 4 Day Walking Festival has been running since 1967. 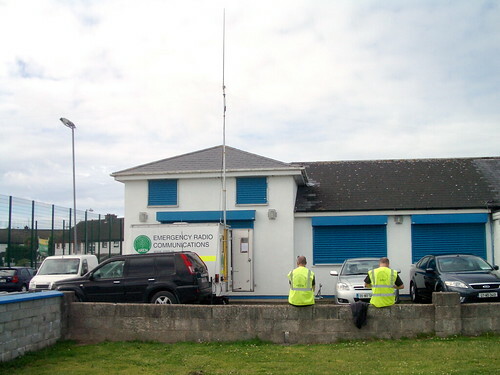 Members of the Galway VHF Group have been involved in providing Public Service communications since 1992. Walkers from over 21 countries participate in this event and the numbers are often greater than 1,700. There are several walks run on each day which range from 10k, 20k, 40k road walks and 30k cross country rambles. This year the event took place from the 1st to the 4th of July. 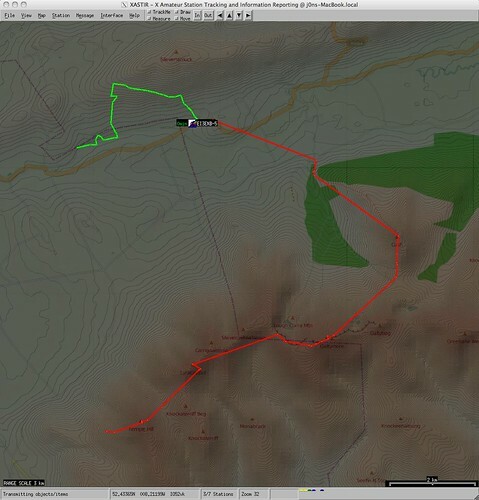 The road walks do not require radio communication as there are regular check points and refreshment stops around the route with regular “patrol” vehicles keeping an eye on the participants who walk at their own pace and also replenishing the refreshment areas. The cross country rambles are lead by a guide and take the walkers through rough boggy terrain in the hills surrounding the Castlebar area. The AREN team assist with the communications throughout the ramble. There can be anything up to 450 ramblers on the guided walk at any one time. The guide plus a team of marshals and medical personnel are all linked to each other by PMR 446 transceivers. Two members of the AREN team are linked in to the PMR network and if an emergency should arise it is their responsibility to communicate with the back-up vehicle following the ramble at ground level. Tom, EI2GP, doubled as medical officer and AREN operator. Joe, EI3IX, an experienced Castlebar hillwalker, was the second AREN operator walking with the group. Steve, EI5DD, was driving the support vehicle and was in contact with Tom and Joe via the 145Mhz/2 metre link. If a situation should arise it would be Tom or Joe who would call the support vehicle. The support vehicle contained equipment such as the defibrillator, medical supplies, additional splints, and medications. If called, the support vehicle could drive to a pre-arranged pick up-point and collect anyone who was unable to continue the walk or deploy equipment required to assist with treatment of a casualty. If an emergency situation was called, either Tom EI2GP or Joe EI3IX linked with Steve EI5DD to organise a pick up point or for the necessary equipment to be made available at short notice. Other duties involved the organisation of refreshment stops as the walkers descend from their hill walk. Once the walkers were on the public highway 3 vehicles were responsible for the safety of the walkers. At times there could be a build up of traffic behind the walkers. After clearing with the lead vehicle, via the radio system, it was possible to bring the build up of cars along the outside of the file of walkers to prevent a long tail of slow moving vehicles at the rear of the walking group. This was something that could only be done safely via the communication system. The lead car would drive ahead and halt oncoming traffic to make it possible to bring cars up from the back of walking group preventing a large tailback of traffic. The system has been well tried and tested over the years and the marshals have become accustomed to radio operation which makes the operation quite efficient. As there are no checkpoints on a guided ramble it is easy to run the communications with a smaller number of AREN operators. 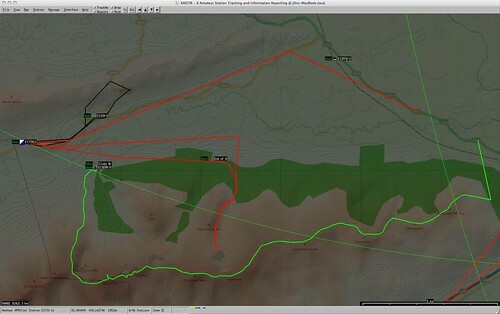 In conclusion there were no emergency calls during the course of the cross country rambles over the four days. Road safety was covered by 3 vehicles when the walkers had to walk along the public highway. At all times, great effort was made to minimise the inconvenience to other road users. Perhaps APRS will be used in future events but it was easy enough to identify where the walk was at all times as a result of the communication between the operators during the walk. The marshals on the ramble have been well tutored over the years and work well with the Galway VHF Group operators. Communications were good and readable at all times during the walk. The Galway Regatta is run on an annual basis on the River Corrib. The event is based on a three lane race down a course of 1200 metres. There are a large number of crews entering the water whilst others are leaving at the finish of their event. Sensible traffic control at the slips prevented accidents and also ensured that there are not too many crews located in the one area at any time- a recipe for disaster if tempers fray. The event is run to strict time schedule which means that all areas have to be clued-in and updated regularly to ensure smooth running. Any delays result in total congestion which can result in accidents. 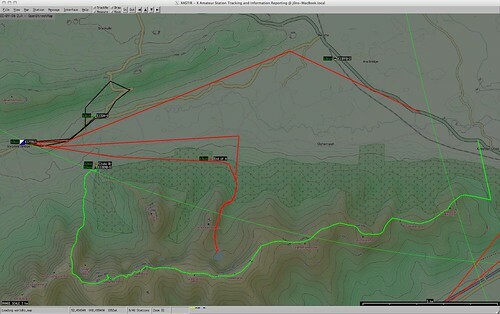 Logging of accidents during the event and deployment of safety crews. From 9 am there was a constant flow of information as crews were co-ordinated to a strict schedule in order to accommodate the number of races during the day. There were stiff breezes which affected some of the less experienced crews often blowing them off course and into reeds. Rescue crews were quite busy under the circumstances. The water level of the Corrib was also lower than usual, due to the recent dry spells. A couple of crews ran aground and had to be towed off the rocks whilst another actually capsized. The slip area was constantly busy under the auspices of Enda, EI3IS. Enda was updated with changes to the schedule and thereby able to call crews to the water as required. Messages regarding crews encountering difficulty with equipment were passed enabling their event to be re-scheduled. The operators at this event have become quite familiar with how it ‘runs’ this year, new operators were present and were monitoring the activity to observe, consider the implications of incorrect information being passed as the event progresses, before taking part the following year. Members of several Amateur Radio Clubs came together to provide public service communications over the weekend of the Galtee Walking Festival June 5th and 6th. Communications were mostly good with the different walks. On Saturday, the weather was fantastic, a small issue with a patch lead was quickly resolved and communications were good for the rest of the day. On Sunday, one walk was “new” and caused some difficulty at the beginning due to difficult communications, but this was quickly resolved. HF (80meters) was used as a backup in order to ensure communications across the Galtee Mountains. This worked very well and EI2KA checked in from Baltimore to check progress at regular intervals. APRS worked very well. This year EI3ENB brought along a Micro-Trak AIO which was given to one of the walk leaders to carry. It worked quite well and gave excellent, trouble free service over the duration of the weekend. EI8JA and EI2JP both had Yaesu VX-8Rs with them which also worked very well. Extensive use was made of the mobile Kenwood TM-D710s in vehicles to act as digipeaters for the lower powered units. The performance of the Micro-Trak AIO was quite surprising, but allowed us to keep an eye on the A-Walks progress on both the Saturday and Sunday. Amateur Radio operators involved included EI5GOB, EI7IG, EI8JA, EI2JP, EI3FFB and EI2GN, totalling approximately 124 volunteer hours over the weekend. Members of the Galway VHF Group provided Public Service Communications during the annual Croi Cycle on Sunday the 23rd of May. The group assembled at 7:45 am to install mobile equipment into the various vehicles used to control the event. Tom, EI2GP, was Medical officer for the day and doubled as spotter in case or cases of emergency throughout the lengthy convoy of cyclists. Gerry, EI8DRB, Provided Net Control and liaison with the HQ in he Maam Valley. Steve, EI5DD, and Arthur, EI7GMB, were located in the course organisers vehicles covering the safety of the event. John EI7FAB, and Joe EI3IX were located with the Repair Crews and dealt with any equipment failures or punctures. Enda, EI3IS, was based in the HQ and dealt with messages regarding the location of cyclists and deployment of refreshments. John, EI1EM, and Eamon Lynch were located with the Civil Defence Emergency Crews. Quite a number of the Cyclists were relative amateurs and participated to the half way point in Maam whilst other more seasoned individuals cycled the complete course around the Corrib which was some 67 miles. The weather was quite hot with only a light breeze and there was quite a call for supplies of water and refreshments to be deployed from one location to another. Much of this was handled via the communications system. The repair crews were kept busy throughout the event. Many calls were put out to assist cyclists stopped by the side of the road with punctures. Any station spotting a cyclist in trouble would put the call down the line and one of three crews would be dispatched in record time. It was possible to deal with many of the mechanical failures such as gear and chain problems although some had to be brought to base in the trailer as a last resort. Communications were good and reliable for the duration of the event and operators were quick to pick up and relay messages where necessary. The liaison with the Civil Defence worked well and on two occasions there were calls for medical assistance which were dealt with quickly and efficiently. Civil Defence had two fully trained EMT’s in the Ambulance who demonstrated their expertise with a fast response time and assessment of the situation (a head and neck injury dispatched by ambulance to the Regional Hospital following medical assessment by EI2GP) Time of call to arrival at scene of accident was 4 minutes. The HF link provided excellent cover throughout the course and enabled the Medical Officer to be contacted even when arriving at the Regional Hospital in Galway. This year is the sixteenth year that the Croi Cycle has been run and the Galway VHF Group has provided the Emergency Communications for each of the events to date. Every year there have been new challenges which have been easily incorporated into the operation and sometimes co-ordinated even whilst the event is in progress. One comment that summed it all up was that “there was comfort in knowing exactly what was happening when a question was asked”. Something that perhaps could not occur when using mobile phones on a one to one basis.